This season, we want to give a shout out to the courageous workers who continue to stand up for our rights—even with the threat of government cuts to wages and labour rights that the most vulnerable Ontarians rely on. Now more than ever, we need workers to be encouraged and supported to speak out about their experiences on the job, and about how strong labour rights can make a difference. That is why the Ontario Employment Education & Research Centre (OEERC), in collaboration with the Workers’ Action Centre, is hosting its 7th annual fundraiser. The money raised through the Workers’ Bowl supports leadership development programs for workers directly affected by low wages and precarious work across Ontario. Supporters like you make it all possible! To show our appreciation we will share a few stories this month about the incredible contribution that workers are making to community organizing and education. Ya Hui is one of our amazing leadership program graduates. Helping workers understand their rights keeps him busy, but he says, “I’m happy because we are doing something meaningful, something for workers.” Back in January, he raised awareness about the minimum wage increase to $14. When franchise owners offloaded the cost of a higher minimum wage onto low-income workers, Ya Hui brought heart and optimism to our support of Tim Hortons workers. Ya Hui brings the same passion to every worker he speaks to, letting them know they now have 10 sick days, equal pay for equal work, and other victories gained through Bill 148. His dedication encourages other workers to defend their rights and speak up for fairness. Language barriers never stop him as he starts meaningful conversations in Mandarin and English, and sparks change in many different communities. 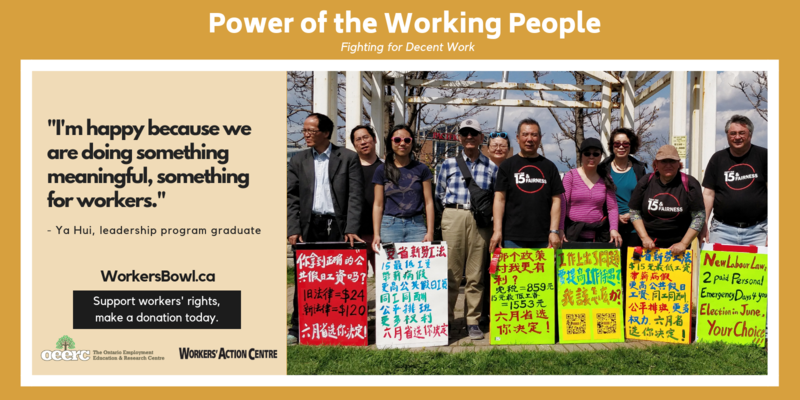 Ya Hui has supported Chinese grocery store workers to find out that they have the right to fair and safe working conditions and decent wages. Many are new immigrants living in poverty and are not sure of Ontario labour laws. He facilitates meetings and workshops, translates important information and writes informative articles in the WAC Members’ Newsletter. His leadership is making a difference across the city. Educational programs provide the opportunity for leaders like Ya Hui to be encouraged to speak out, learn how to organize, inspire and empower communities by spreading knowledge about our rights at work. Real change is coming to Ontario through the leadership of everyday, working people. Please consider making a donation today. Each dollar helps fuel community and leadership development that impacts thousands. (Tax receipts are available for donations of $10.00 or more.) Please share this story with your network, and feel free to contact info@workersactioncentre.org to host a Know Your Rights workshop in your community. Thank you for your support!